Despite Liberalisation phase Govt. of Bihar is running 80 plus public welfare schemes. The claimant of these different entitlements runs in millions in such scenario, there tend to be scope for Grievances among citizens. Keeping this in mind, civil society across the state (as well as country) is in conversation with govts. for creating a platforms within the governance to readdress these grievances. Govt. of Bihar (being socially more sensitive) acted on its own and incited an act called Bihar Lok Shikyat Nivaran Kanoon. Under this act any common person can petition the govt. for any of her grievances. Soochana Seva West Champaran team along with Jan Jagriti Shiksha Sansthan (JJSS) and Majdoor Kisan Shakti Sangathan held camps at Araira and Kathihar from Dec 6 -12, 2017. 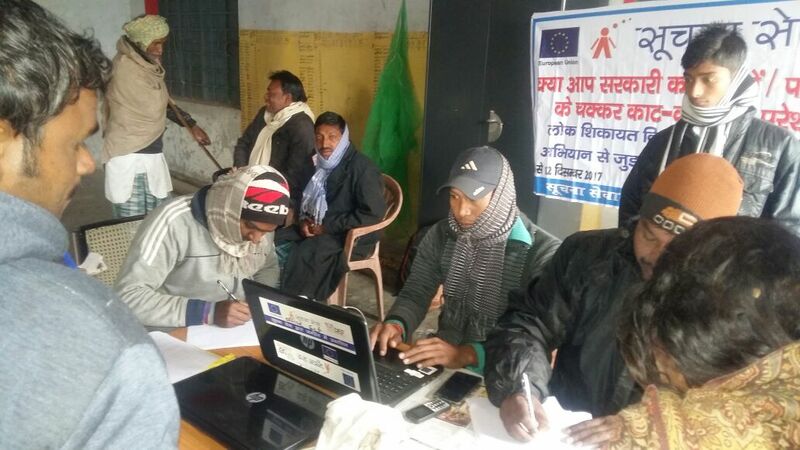 After returning from this camp, Soochna Seva team held Grievances camp at Pirari Panchayat of Mainatand block, Bihar. In a day long camp, held at MGNREGA Bhawan about 138 grievances were received. Most of the grievanceswere related to Food Security and Civil Supply department and Social Security Pension. The team has collected the forms and intends to apply through online portals. In coming days, similar camps will be held at Sikta, Lauriya, Ramnagar and Gaunaha blocks of West Champaran, #Bihar as well.